Once upon a time, long ago and far away, like maybe 30 years ago, when I was in my 20s, I went on an Unexpected Journey. I had just dropped out of a graduate social work program and written a children’s book. I dreamed of a different sort of life, one filled with art-making and community. But, in fact, I was very alone and had no idea what I was going to do with my life. Somewhere I read about this Three-Month Living/Learning Seminar in Alternative Communities, offered for graduate credit through the University of Wisconsin-Milwaukee. Participants would live one month each in three different intentional communities, High Wind in Wisconsin, Sirius in Massachusetts, and—the only community I’d heard of, the Shangri-la of alternative communities—Findhorn in Scotland. I signed up. Then I moved back home since my lease had run out and I was no longer going to school. Squeezed back into the family home, my dreams contracted as well. It was hard to imagine being able to just go off to live in community for three months and imagine a better world. It seemed unrealistic somehow. And it occurred to me that I would have to tell my parents. I canceled my registration. And Belden Paulson called me. The professor behind this three-month seminar and founder of High Wind Community with his wife, Lisa, called to persuade me to give the seminar a chance. Like a herald, his call sounded a clarion, reawakening my dreams and desires to build a bright new world. I told my parents about this seminar I had signed up for. To my great surprise they offered no objections. I emphasized the green building and organic gardening. The fact that the seminar offered graduate course credits probably didn’t hurt either. I arrived at High Wind with 12 other seekers. I was not the only one who had temporarily backed out at the last minute. We came together as a group of explorers, reveling in morning talks with David Spangler and others, working on community projects in the gardens, kitchen, and bioshelter in the afternoons, creating rituals and art-making. We explored community through labor, art, and spirituality within an intentional community but, more than that, we became a community. The 13 of us became our own traveling community. I wrote a story within a story, a mythological representation of our coming together as a community. Borrowing from a recent Star Trek movie with only slight adaptation, just because I liked the sound of it, I named the 13 of us together the Koboshi Maru and each of us separately the Warrior, the Prophet, the Seer, the Shepherdess, the Scholar, the Healer, the Harpist, the Mystic, the Bard, the Jester, the Builder, the Sage, and the Spinner. Our last night at High Wind, I read aloud the tale and found my voice as the Spinner of Tales. I continued the story as we traveled to Sirius, reading the latest installment aloud before we headed to Findhorn, but I never finished it. This unintentional intentional community we had become, the Koboshi Maru, gave me my most direct lessons in community. As we left High Wind to join Sirius and then Findhorn, we were now something more than just a random gathering of individuals. We were a community trying to fit inside another community. Our boundaries clashed, contracted, and expanded. The shifting dynamics of community, the difficulties of consensus, the challenges of personalities, changing allegiances, and individuals leaving and joining were all experienced personally, not theoretically or by objective observation. I had no final installment to read before we left Findhorn. Instead, I badly sprained my ankle trying to return a bag of treasured rocks to the beach. This was my sign to stay, a nomadic wanderer, three more months in Great Britain in order to return to Findhorn for a three-week Sacred Dance Workshop, another dream I had thought impossible until I did it. For many years, the story hung over my head in its incompleteness. Maybe because I knew how it went. The Koboshi Maru, the 13 who were no longer 13, scaled the Glass Mountain, found the treasure and variously weighed themselves down with it or gave it back to the beach, and then returned home, going their separate ways. It was a tale of There and Back Again. The Three-Month Seminar remains a touchstone experience in my life. I often feel I have not lived up to its expectations. I have not lived the life I dreamed of living. I have not changed the world. I have not created an artists’ community or even created a living as an artist. I am not the writer I had hoped to be (though I have not entirely given up hope either). I could go on but do we ever entirely live up to our youthful dreams and expectations? Life takes us on a journey and it is rarely the journey we had expected or planned. My three-month travels into and part of intentional communities gave me the tools to make sense of the journey. To know when it is time to enter the darkness and wait for the seed to germinate; when to nourish the seedling; when to relish the beauty of full bloom; when to harvest, give thanks, and let go. When I remember the lessons rather than the dreams of community, I know I am who I am because I once was and always will be one small pearl on the string of the ever-expanding Koboshi Maru. I am a storyteller because of the three-month seminar. I found my voice as a shaper and teller of tales at High Wind. I moved to Wisconsin because of the ties I formed to the land and people there. And I have traveled from there to live and work in various other parts of the country because I learned it was possible to make community wherever I went. I may have never lived in intentional communities beyond those long-term visits but I have carried the desire to create community with me. The pull of community has led me to facilitating a neighborhood Eco-Team; to becoming a folklorist, a librarian, a yoga teacher; to starting story circles and dream groups; to choosing to travel by foot and public transportation when I can; to meeting my neighbors as I walk the dog; to finding myself ahead of the curve when it comes to organic produce, green living, sustainable economy. It is the small things from this Unexpected Journey that have shaped my life. Motherpeace and Angel cards. The Game of Life. Art-making as a process rather than a product. Ritual. The power of imagination. The friendships and connections. Rutabagas. Listening for that small still voice within. But those small things add up. They become part of the daily choices that I make. Bilbo may have used his ring only to make magical appearances and disappearances from Shire gatherings after he came home from his Unexpected Journey but he was changed, nonetheless, in a deeply profound way. When you go There and Back Again, you never come back the same, even if the life you slip back into is a profoundly small and ordinary one. Once upon a time, I went on an Unexpected Journey. Though I left and came back home again a long time ago, the Journey itself has never ended. 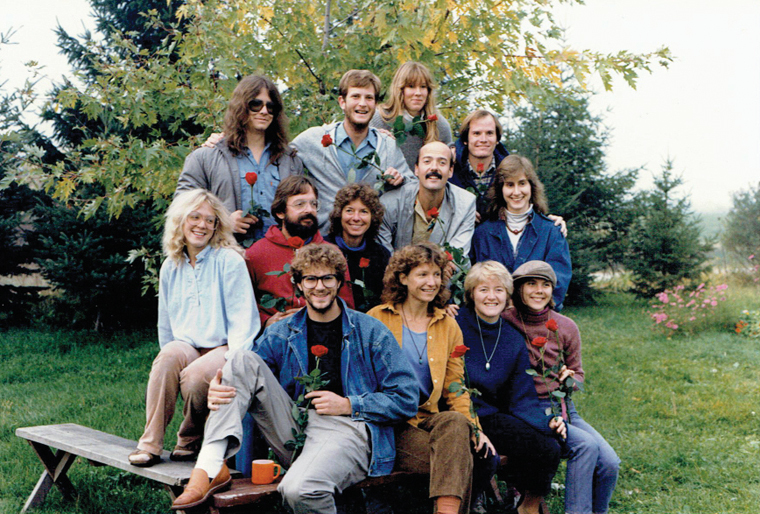 Elizabeth Matson participated in the three-month Living/Learning Seminar in 1984. She is a storyteller, writer, and yoga teacher, currently making her living as a youth/teen librarian in Arizona. ← Matching Funds Offered to Enhance the Directory! Hi Elizabeth. Join us in Colorado. We are starting Artists Cohousing. http://www.artcoho.org. We are looking for property. My number and email are on the website. We have 12 family units already.